POLISHED STAINLESS TIPS , BOLT ON INSTALLATION. AWESOME SOUND AND PERFORMANCE! 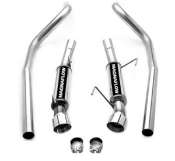 2.5" DIA PIPE.4" DIA TIPS.ROUND MUFFLERS OFFER A MORE AGRESSIVE TONE.